We are so happy to see signs of spring all around us. However, as you all know, living in Utah means that the weather changes often. Please continue to send your child with warm outdoor clothing. Students will continue to go outside as long as it is not raining or under 20 degrees. Students need to get outside to run and play. It is essential to their overall well-being. Please help us by sending them to school ready to enjoy the outdoors. 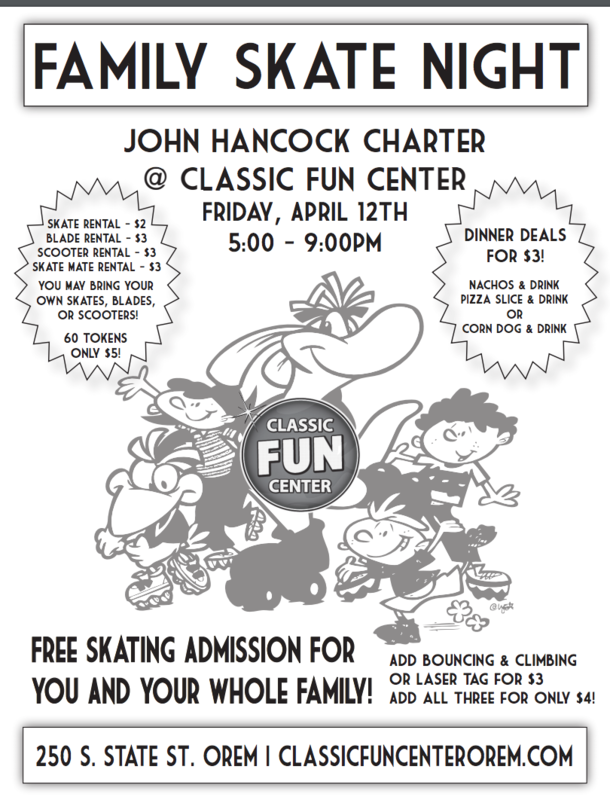 Classic Skate Night is this Friday, April 12th from 5-9pm at Classic Fun Center in Orem. 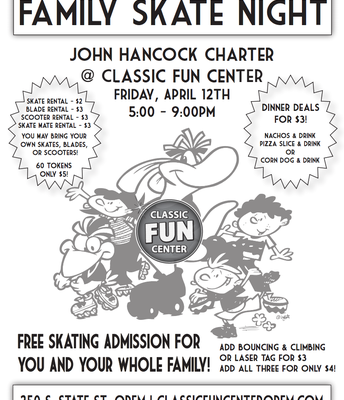 Admission is free, however you need to pay for any rentals including skates and the other activities. Friday, April 19th is our Annual Earth Day at JHCS. Students will help clean and beautify the campus that day. All students are allowed to wear modest street clothes because they will be cleaning and helping with light yard work. Volunteers are welcome that day to help us clean the campus. Students may want to bring work / gardening gloves to school that day. 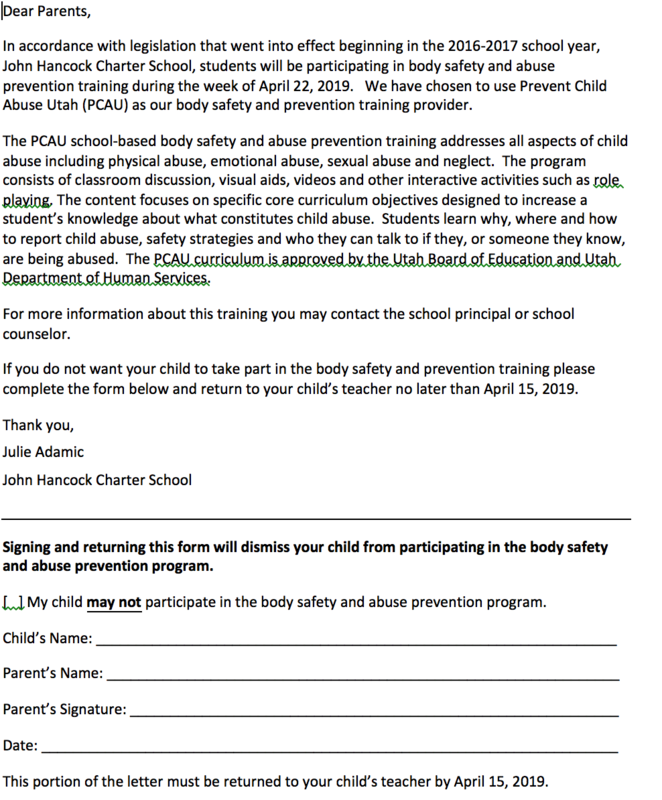 As per state rules, students will participate in a prevent child abuse presentation on April 22. 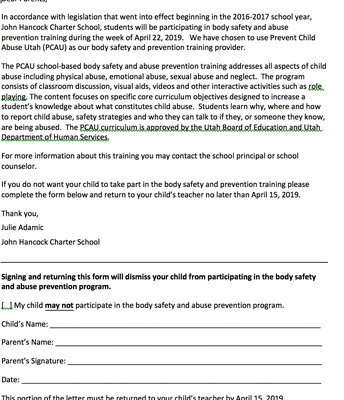 Attached is a form you can fill out to opt your child out of this presentation if you wish. JHCS will be participating in The Great Utah Shake Out on Thursday, April 18th. Students will experience an earthquake drill followed by a fire drill. Students in grades 3-6th will participate in the Utah RISE assessments beginning on April 29th through May 17th. 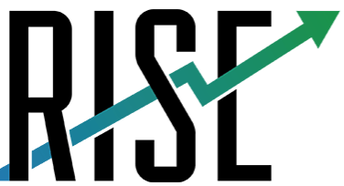 The RISE assessment replaces the SAGE. If you have any questions, please contact your child's teacher or Mrs. Adamic. 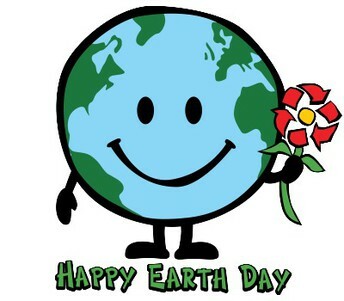 Monday, April 22nd all students and faculty will have a large group photo taken. Please ensure your child is part of our JHCS history by being at school that day to participate in the group photo.